For long standing vapers, the award winning Decadent Vapours needs no introduction - the flavour house and e-liquid manufacturer was the very first to manufacture e-liquids right here in the UK. 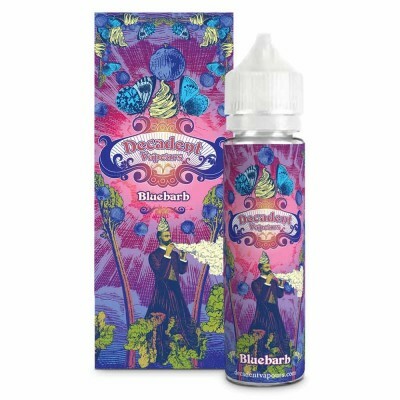 In the early days, Decadent Vapours were known for their huge and customisable range of flavours. These have now been whittled down to their very best juices, and in this range, called the “World of the Bizarre”, you’ll find six unique flavours to enjoy. The juices here come with a VG:PG range of 60:40, which can be used for mouth to lung or direct to lung vaping. Each 60ml bottle contains 50ml of juice, with space to add 10ml nicotine shot. Choccywoccymoo: Rich chocolate sweetened with a sprinkling of Marshmallows. Best used in drippers or RDAs. It’s a Trifle: Raspberry and strawberry jelly with custard, whipped cream and sprinkles recreate the traditional British dessert. Lemon Puff: Sicilian lemon ice-cream encased between two puff pastry wafers. Strawberry bon-bon: Strawberry toffee sprinkled with powdered sugar.